The close proximity of blood vessels to the brachial plexus nerves can confound nerve visualization in conventional fat-suppressed 3D T2-weighted sequences. Vessel suppression can be accomplished by means of motion-sensitizing preparation. 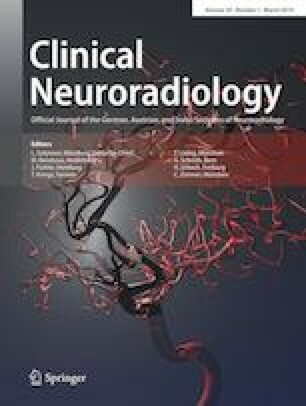 The aim of this study was to qualitatively and semi-quantitatively evaluate short tau inversion recovery (STIR) 3D turbo spin echo (TSE) in conjunction with an adiabatic T2 preparation incorporating motion sensitization for magnetic resonance neurography (MRN) of the brachial plexus in a clinical routine setting. The MRN of the brachial plexus was performed in 22 patients (age 45.5 ± 20.3 years) with different clinical implications using the proposed improved motion-sensitized driven equilibrium (iMSDE) STIR 3D TSE and the STIR 3D TSE. Images were evaluated regarding image quality, overall artifacts, artifacts caused by vessel signal, signal homogeneity, visibility of small nerves and signal contrast. Furthermore, signal-to-noise ratios (aSNR), nerve muscle contrast to noise ratios (aNMCNR) and nerve vessel contrast to noise ratios (aNVCNR) were calculated and compared. The incorporation of motion sensitization in the T2 preparation resulted in robust blood suppression across subjects, leading to significantly higher aNVCNRs (p < 0.001) and aNMCNRs (p < 0.05), increased conspicuousness of the nerves, better vessel suppression and image quality and less artifacts compared with STIR 3D TSE (p < 0.001). The incorporation of the proposed adiabatic iMSDE-based motion sensitization was shown to provide robust blood suppression of vessels in close proximity to brachial plexus nerves. The use of STIR iMSDE 3D TSE can be considered for clinical MRN examinations of the brachial plexus. The present work was partially supported by Philips Healthcare and the European Union (ERC-StG 2014 iBack). E. Klupp, B. Cervantes, N. Sollmann, F. Treibel, D. Weidlich, T. Baum, E.J. Rummeny, C. Zimmer, J.S. Kirschke and D.C. Karampinos declare that they have no competing interests.